How did you first hear about the Chukchi whale rescue, the event on which you based your new children's book, A Symphony of Whales? I first learned of the rescue one winter while on tour in Alaska. The Chukchi Peninsula is located right across the Bering Straight. So people up in Alaska knew about the rescue, even though folks in the lower 48 didn't. My "Whale Trilogy" piece (click to hear the mp3) for solo violin and whales was a direct response to first hearing this true story. I've since performed it everywhere from schools and town halls to The Kennedy Center. People are always awed to hear of 3,000 whales, trapped in the sea ice, and rescued with the help of classical music and a Soviet icebreaker. They're also amazed such a thing really happened without ever hearing about it on the evening news. Why didn't the rescue receive more press at the time? There were many factors at work. It all took place in 1985, during the depths of the Cold War. This was not a time foreign reporters roamed about freely in the Soviet Union. Whereas most news crews prefer a fast breaking story, this one stretched out over seven long weeks. Then there was the remoteness of site coupled with the Siberian winter. No airports, no hotels, no phone lines. Had the whales been trapped on a beach in the Bahamas, it would have been very different! Why do you think the whales responded to classical music? One possibility is that music played from the icebreaker simply calmed the whales enough so they werent afraid of it. Or perhaps the whales really liked the music and wanted to hear more. I also wonder if just maybe the whales experienced their own Mozart Effect. Is it possible the music stimulated their spatial reasoning skills, as it does with humans? Did that help them find their way out the narrow ice-cluttered channel, back to the open ocean? When did you first become interested in whale songs? While I was at Oberlin College, studying baroque violin and biology. Dr. Roger Payne, who did much of the pioneering research into whale songs, came to campus with his slides, field recordings and his cello. That evening forever changed how I heard music and thought about whales. Shortly afterward, Pete Seeger came to campus and sang his Song of the Worlds Last Whale. The next week I went out and bought a used folk guitar for $25 and never looked back. I still love classical music, especially Bach. Youll hear his influence in some of my pieces too, along with a love of Gypsy and Celtic music. But there is also a lot of natural history at work. I love music that conveys a sense of place, that tells a story or paints a picture. Whale songs do all of these. Why is a whale song like a symphony? Like a symphony, some whale songs may last 20-30 minutes. They are not just streams of random notes, but show enormous complexity and organization. Within a song there are different themes and variations, much like different motifs in a classical work. Whales also show respect for the music score. Committed entirely to memory, the notes and phrasing to a given song change only gradually as time goes by. Some whale songs even use a kind of rhyming scheme, presumably to make it easier to remember what comes next in the piece. Symphonic composers use different instruments to make a melody interesting. Now imagine being able to sing all the notes of the orchestra by yourself. This is what whales do. How did you get the idea to write your "Whale Trilogy? Several years ago a childrens book editor in New York heard a live performance of my Whale Trilogy. She tracked me down and asked if Id consider writing a book based on the musical rescue. A Symphony of Whales is the result. Besides the book, Ive also created an orchestral adaptation of the story. Imagine Peter and the Wolf meets up with whales! In this version I appear on stage as both soloist and narrator. Illustrations from the book are projected onto huge screens, accompanied by full symphony orchestra and whale songs. Is the little girl Glashka in A Symphony of Whales based on a real person, or did you create her? Many children, like writers and musicians, hear music and voices in their heads. When I wrote this story, I wanted to tell it through the eyes (and ears) of such a child. While I dont know of an actual child by that name, there certainly were people like her in that village who felt the call of the whales. Once youve heard, really heard the song of a whale or any other living thing, its hard to give up on them. I hope that every village and city and town around the world has children like Glashka...and that grownups will listen to what these children hear, too. Why did you visit Alaska in the winter? What are some of your memorable experiences there? I went to Alaska in the winter of 1990 because... thats when I was hired! But performing in native villages on the Arctic Circle, venturing out with a sled dog driver at 40 degrees below, seeing the eerie northern lights and long winter darkness... these are experiences you dont get in many places. They later gave rise to the imagery found in A Symphony of Whales. Without having spent a month in Alaska, I would not have been able to write the book the way I did. Thats why in writing workshops I encourage folks to describe places theyve observed closely, characters they know well, or can imagine in great detail. Other memorable moments from Alaska: the tour organizers last minute advice on what to do if my bush pilots plane went down; an emergency landing on a frozen river at minus 54 degrees, just as the fuel lines were starting to freeze; packing my guitar and violin in special thermal cases inside mummy sleeping bags; learning how to start a truck at 45 degrees below with a four foot long flame thrower; and eating lasagna made from llama steaks! Do all your stories have musical connections? Its actually hard for me to say where stories end and music begins. Most of my stories have music running through them, just as many of my favorite songs are story songs. The Gift of the Wee Folk is a good example of both. Its a traditional Irish tale thats been kept alive for hundreds of years through oral tradition. In live performances, I weave Celtic guitar accompaniment throughout the story, along with a singing part for the audience. Enough people began coming up to me after shows asking if there was a book, I finally had to write that too. The challenge then was to convey the cadence of the character voices and the music in the language of the book. As with the trip to Alaska, here too it helped greatly to visit Ireland, walk her stone walls and green countrysides, and listen closely to the music and speech patterns. You have played your violin in a number of unusual places. Where was the strangest? The most inspiring? The most fun? Ive always loved how the violin sounds in unusual places. On our honeymoon, my wife and I managed to find our way into a sea cave that is only accessible at low tide. Id packed along a violin (an inexpensive one, just in case). We had a great time listening to how the violin notes reverberated off the low rock walls and ceiling. In the darkened tide pools, sea anemones waved their arms slowly to the rhythm of the waves. Seaweed hung from the walls and ceilings, adding to the overall effect. Why is music an important part of a child's education? Music is a doorway to the imagination. Along with storytelling, it is a powerful force to develop minds that can remember and think creatively. Current research into the Mozart Effect shows how listening to certain kinds of music can stimulate brain development, particularly mathematical and spatial reasoning skills. Music and stories also touch our interior selves, our spirit and emotions. They help draw us together as communities, and develop empathy and awareness of others. I was lucky to grow up in a home surrounded by music. While neither of my parents was a professional musician, both played a little piano and a lot of records and tapes. Choral harmonies fascinated me even as a child. Mom usually read us a story at bedtime. Sometimes she sang lullabies, too. On camping trips, wed get to hear one of Dads ghost stories. My parents probably did these things because they were fun. But they were much more than that. Parents who play music and read aloud to their children give them a head start on a lifetime of learning. A love of beauty, curiosity and imagination... these are gifts that will never grow old. You have said "Life is a symphony, not a sound bite." How does this philosophy inspire and inform your work? Like many artists and educators, I am concerned about a growing sound bite mentality in everything from arts to news to politics. What happens to art when it is reduced to a short blurb? What happens to us? What happens to our society? Nowadays we get a whirlwind flurry of information, but with only the lightest dusting of meaning. Meaning requires time and context. Sound bites offer neither. Deep down, I want to hear music and read books that stretch the imagination. I want in-depth interviews and documentaries that challenge us to think and remember. I want to feel real sand between my barefoot toes, not virtual, and wonder at the nighttime sky. I want to hear my own muse, yet also raise my voice with other voices, to make a symphony worth living for. STEVE SCHUCH has delighted audiences of all ages across the U.S. and Europe. Classically trained on violin, he also is an award-winning author, singer/songwriter and storyteller. Venues range from schools and town halls to symphony orchestras and The Kennedy Center. Haunting violin and whale calls... music and tales of Ireland... a pizzicato interpretation of a Picasso painting... these are just part of Steves wide-ranging repertoire. Honors include composer awards, PBS soundtracks and five fiddling championships. Steves recordings with The Night Heron Consort are national best sellers. His musical story, A Symphony of Whales, has received five national book awards, and his childrens recording, Trees of Life, the Parents Choice Gold Award. For four years Steve taught a graduate course on integrating music and storytelling into classroom curriculum. 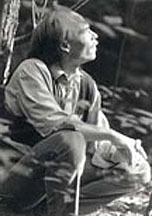 A former Audubon naturalist and Peace Corps volunteer, he lives on a farm with his wife and various creatures. Personal interests include white water canoeing, Mexican food and relating to large reptiles. We also recommend visiting Performances, Workshops for All Ages, Specialized Workshops, Workshops for Educators & Parents, Recordings, Books, and School Assemblies. This Author's Interview may be quoted or downloaded in its entirety for press purposes. * Whale Trilogy may be heard on the Wellspring album. audio sample. ** The Twelve Days of Christmas may be heard on the A Celtic Celebration Vol 1 album. *** Scottish Baroque Fantasy is on the Circle of Days album, and The Shores of Lillisand album. 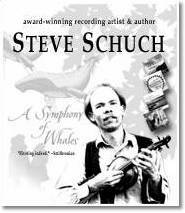 Review copies of Steve Schuch's CD's are available. Please inquire with him.